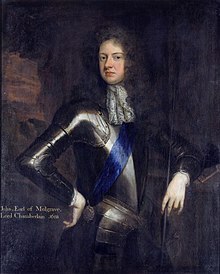 John Sheffield, 1st Duke of Buckingham and Normanby, KG, PC (7 April 1648 – 24 February 1721), English statesman and poet, was the son of Edmund Sheffield, 2nd Earl of Mulgrave, and succeeded to that title on his father’s death in 1658. Essay on Poetry (published 1723). "'High characters,' cries one, and he would see/ Things that ne’er were, nor are, nor e’er will be", John Suckling, The Goblins, Epilogue. "Whoever thinks a faultless piece to see,/ Thinks what ne’er was, nor is, nor e’er shall be", Alexander Pope, An Essay on Criticism (1711), Part II, line 53. This page was last edited on 9 March 2017, at 23:45.